Ever since last week, I am still mesmerized by the beauty of this girl. Altogether with her twin sister Yumeno, SDGrG Nono OE, she is my grail doll. Never before I feel that I want to get a doll so badly before. And a girl! I never want to own a girl doll before!! 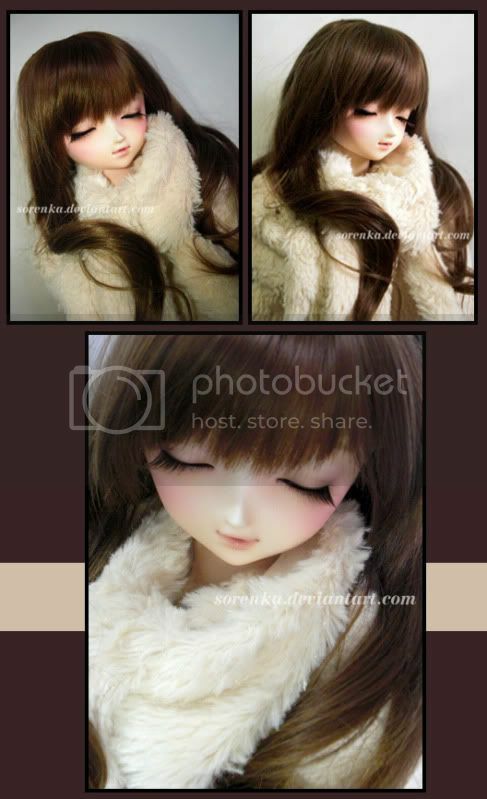 *well, at least, before Orianne* While I have known Volks mold are so expensive, apparently that doesn't stop my urge to adopt this girl. Heeeee... Baru kali ini aku ketemu yg spt Chan. So true. That beauty is what captures me. I wonder where we can actually buy that lash shape? Are there companies which sell a similar one? Those sold in companies are the plain one. I think it's a normal pair of lush lashes, cut to shape? Either that or look for human lashes, I'm sure there'll be that style. :> Dolly Wing #10 looks rather like those, but they're kind of pricey to use on dolls haha! just a thought (wouldn't hurt to ask & no obligation as well) i am rehoming my little monica body since I have committed to sell my Liselotte. Would you be keen? I can consider rehoming it at US$380 including registered airmail to Indonesia for you if you like. Let me know?? I will be very happy to accept that offer. Thank you for letting me know! But there are some details I need to discuss. I will contact you in DoA.